Newly discovered Tamil inscriptions from the area around Tambaram were reported by us in the College Magazine of 1973 and we give here some details of inscriptions found more recently from this area. Some of the inscriptions are reported for the first time and most of the texts are given in full for the first time. A group of students of the Statistics Department have learned to copy and read early Tamil inscriptions. Tamil inscriptions, though mostly written in an early script, can be deciphered without too much effort. Every inscription contains the name of the king influential in that area and his regnal year. It may also contain a long list of achievements of the king (called the meykirthi) which is an important source of history. If the inscription is a copy of a legal document pertaining to the local temple then it has the name of the village and the temple. There are inscriptions which are copies of documents of a purely secular nature even though they may be found inscribed on the walls of the local temple. From inscriptions one may get interesting information on social customs, local disputes, the different kinds of taxes and the prices of different commodities. Here we shall discuss certain Tamil inscriptions of the Tambaram area belonging to the Chola, the Pandya, the Telugu Choda and the Vijayanagar dynasties from the twelfth to the fifteenth century A.D. The inscriptions are of interest from the point of view of local history and give us a clue to the antiquity of villages and towns of the area. Pazhavantaangal is a new railway station situated between Meenambakkam and St Thomas Mount Stations. (To some of us it is Palatingal Station and reminds us of a former Professor of Physics, Dr Jose Palatingal). The name of the station is derived from the two Tamil words Pallavan and taangal, meaning the lake of the Pallava king. One may recall that the famous bird sanctuary Vedantaangal has the ending taangal which means a lake. Very close to Pazhavantaangal is Pallavaram which is famous for its cave temple of the Pallava king Mahendra of the seventh century A.D. Inscriptions refer to Pallavaram as Pallavapuram or Pallaapuram. Chromepet is named after the chrome leather factory and Sanatorium after the Government hospital there. Tambaram is sometimes wrongly derived from the word taamiram or copper but we know now that the second part of the word was once puram meaning a village (MCC Magazine, 1973). We came across a Tamil inscription written in 1280 A.D. at Pammal village where Tambaram is also referred to as Gunaseelanallur. We have copied another inscription from Tirukachur, near Singaperumal Kovil, an inscription of the thirteenth century which refers to Tambararn as Taampuram. The same word can also be read as Dharmapuram or Taarna Puram, since in the early Tamil all the three forms would be written in the same way. From an inscription at Perungalathur, it was found, that the village existed in the Chola period and it was called Perunkulathur, the village of the big tank. Alternatively, it may also stand for a large village with a tank. The village belonged to Nedungunra Nadu named after the village of Nedungunram situated south of the campus. Even though Tambararn is close to Perungalathur. it belongs to a different Nadu called Churathur Nadu, named after Thiruchuram, the modern Trisulam village near Pallavaram. The Churathur Nadu extended from Tambaram in the south to Adambakkam and Alathur (Alandur) in the north and included Pammal, Pallavaram and Tirunirmalai. We came across a Tamil inscription, (MCC No. 1972/04, MCC Magazine, 1973) at Vandalur which refers to the place as Vendalur (or Veyndalur). The inscription mentions the name of the Vijayanagar viceroy Maharnandaleswaran Saaluva Narasimha, who usurped the throne in the fifteenth century and to Naagama Naik, a famous general of the Vijayanagar kings. Somangalam is a small village about 10 km west of Tambaram. There we came across a number of Tamil inscriptions, many of which had not been reported before. Two old temples in the village contain inscriptions of kings and chieftains belonging to the Chola, the Pandya, the Telugu Choda and the Vijayanagar dynasties. A Chola inscription (MCC No. 1974/ 02) of Kulothunga III refers to his victories over the kings of Ceylon and Madurai. The inscription of the fourteenth year of the king corresponds to January 2, 1192, on the basis of astronomical data given in the inscription. The inscription refers to floods during the twelfth year of the king and states that the lake bunds were destroyed in seven places on the same day. The bunds had to be repaired. In order to prevent future flood damage, the village council was given forty gold coins called kaasu by one Tiruvekambamudaiyaan, Kannappan of Tiruchuram. Forty kaasu is equivalent to twenty kazhanju which is about 100 gms of gold and is about five thousand rupees worth. Out of the interest (palisai or polisai) accrued from the amount, the village council (maha sabhai) had to maintain the bund. In this inscription the village is called Panchanadivaana Chadurvedivangalam. Another inscription (MCC No. 1974/01) of Kulothunga refers to Somangalam as Rajasigamani Chadurvedimangalam and the deity as Someesuramudaiyar. Two donors, one of whom a priest of the temple, gave a kaasu to the local oil vendor in order that he might daily provide enough oil for burning a lamp (sandhi vilaku) during evening worship. The inscription ends with the wish that this may go on for as long as the sun and the moon last. An inscription of an earlier period is found in the Vishnu shrine of the same village. The inscription could not be copied but part of the text is available (South Indian Inscriptions, Vol. Ill, Part II, 1903). It refers to the deity as Tiruchitrakoodathu Aalvaar -- or the god of the hall of paintings. The king referred to is Rajendra Chola and is most likely to be Kulothunga I since it refers to the king's practice of sitting on the throne with his consort Bhuvanamuzhuthu Udaiyaal. The two inscriptions of Sundara Pandya found by us at the Siva temple had not been noted by earlier epigraphists. The first one (MCC No. 1974/05) belongs to the tenth year of Tiribhuvana Chakravarthigal Sundara Pandya Devar. Somangalam was part of Kunrathur Nadu of Puliyur Kottam, named after Puliyur, which is situated near Kodambakkam railway station. The name of Puliyur Kottam had been changed to Kulothunga Chola Vala Nadu or Kulothunga Chola Valavan Nannadu (MCC No. 1974/09). However, the earlier inscription of Kulothunga 1 refers to Sornangalam as a village in Maaganur Nadu of Sengaattu Kottam. This shows that the boundaries of the Nadu had been changing from time to time. The inscription refers to certain lands of Vellarai village belonging to a man from Nedunkunra Nadu bought for the temple. Today there is a village called Vellarai on the Vandalur-Sriperumbudur road. The area around Vellarai contains white clay known as Sriperumbudur shale and is a good place to look around for fossils and leaf impressions. The donor was a local chieftain called Panchanadivaanan Arunagiri Perumal Nilakangarayan. The same chieftain is referred to in an inscription at Tirukachur dated 1293 (MCC No. 1972/01). The donor arranged for the monthly worship at the temple on his birthday on Revathi Nakshatra. The inscription refers to the temple as palathali where many deities were worshipped. Apart from. Devadaanam, the property of the Siva temple and Tiruvidaiyattam, the property of the Vishnu temple, and Pidaaripatti, belonging to the Amman temple, the area belonging to the Jain or Buddhist temple is also mentioned. It is referred to as a palli chandam, a tax-free area. The chieftain had ordered that the various taxes collected in the donated lands should go to the temple. In the second Pandya inscription (MCC No. 1974/06) the donor is another Nilakangarayan called Panchanadivaanan Nallanaayan whose birthday is on the day of Uthirataadhi Nakshatra. The inscription is in the twelfth year of Jatavarman Sundara Pandya. Only part of the inscription was read. When the Chola kings became weak during the thirteenth century, the Pandyas and the Telugu Chodas became influential in the Tambaram area. A third Pandya inscription (MCC No. 1974/09) belongs to Jatavarrna Sundara Pandya and is found on the Vishnu temple. This has not been reported before. It refers to an officer called Tiruvaikezhvi who took down the words of the king and acted on his behalf. The Vishnu temple of the village is referred to as Tirumerkoil or the temple on the western side of the village. A lady donor is referred to by the word saani which is now a suffix for the word duraisaani, the wife of durai a European. A priest in the inscription is referred to as Neervannan and Ramabhiraan. The donation of the land is for burning an evening lamp. The same set of persons involved in the land transactions are again referred to in the inscription (MCC No. 1974/08) of the Telugu Choda king Vijaya Ganda Gopala found on the same Vishnu temple. Two lady donors are mentioned -- one called nangai saani and the other piraati saani, the priest's wife. For burning the evening lamp a gold coin called the Ganda Gopala Maadai was received from the second lady. The inscription ends with the phrase Sri Vaishnava Rakshai asking the Vaishnavites to carry on the requirements of the endowment. An inscription of the eleventh year of the Chola king Rajadhi Raja Deva (MCC No. 1974/04) refers to the place as belonging to Puliyur Kottam but gives no details about the Nadu to which it belonged. The king is identified as Rajadhi Raja II who ruled from 1163 to 1179. One Chandrasekaran of Ikkattu Kottam donated one cow for an evening lamp. An inscription (MCC No. 1974/03) of the seventh year of Raja Raja refers to Nilakangarayan. The king is most likely Raja Raja III who ruled in the thirteenth century. The chieftain is Kulothungachola Kannappan Aadinaayan Nilakangarayan. A group called Tiruvunnazhikai Udaiyor received the gift of five cows, the income from which they agreed to use for the daily offering and for curds. An inscription of Vira Rajendra Devar from Kaavanur near Kunrathur refers to a committee of the inner sanctuary called Tiruvunnaazhikai Sabhai and we can infer that there was a committee of temple priests for the inner sanctuary of the temple who took the responsibility for the daily worship and offering. There is another inscription (MCC No. 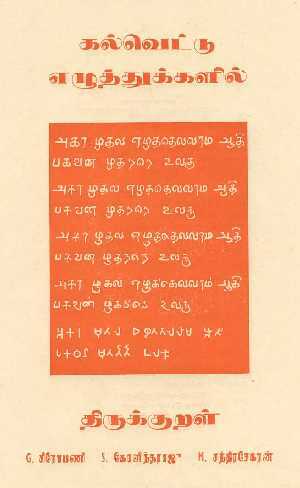 1974/ 10) of Raja Raja in his twenty-fifth year but the full text of the inscription is not available. The Vijayanagar inscription (MCC No. 1974/07) of Mallikarjuna Raya of the fifteenth century had not been noted before. This has the auspicious beginning Swasti Sri like all the earlier inscriptions. It is written in large letters and goes round the apsidal Siva shrine in a script which is very much like the modern Tamil script in many respects. The king ordered that the tax called idangai vari be given as an endowment to the temple. The general term idangai refers to the trading and manufacturing communities. One such community were the kaikolar or weavers, whose chief was called the kaikol mudali. The document was signed by one aanai meyl azhagiyaan. Inscribing on the stone walls is here called silaalekai. Most of the inscriptions reported here were read by R. Chandrasekaran of I. M.Sc. (Statistics). The team of students who took estampages of inscriptions includes Abdul Huq, R. Srinivasan, B. Jeyasimha and Manickaraj Abel. The readings were rechecked by Mr M. Chandrasekaran of the Department of Statistics. However we wish to treat our readings as tentative. Reference : No. 183 of 1901, Annual Report of Epigraphy, Epigraphica Indica, Vol. VII. Date : I2th century A.D. Date : 13th century A.D.
Year of ascension to the throne: 15, 16 .